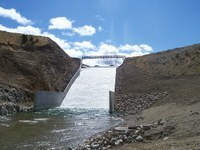 The Dam Safety Program regulates the construction, operation, and maintenance of Montana's dams to protect life and property from damages due to failure. The Dam Safety Program also provides training and outreach to dam owners and engineers, and assists with emergency preparedness activities. Assists the 136 locally administered floodplain management programs throughout Montana in reducing the loss of life and structural property through wise floodplain development, and in reducing the loss of functional floodplains by reducing the amount of erosion of stream banks due to unwise floodplain development throughout Montana.